Ships from and sold by Great Brands USA. *Discontinued. 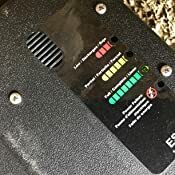 New and upgraded ESP25 available underneath bullet points. Sold by Mott Company and ships from Amazon Fulfillment. 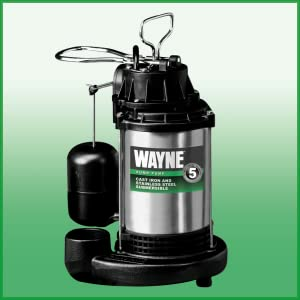 Located in Harrison, Ohio, Wayne Water Systems, a division of the Scott Fetzer Company, is one of the market leading providers of residential, worry-free, water handling solutions. 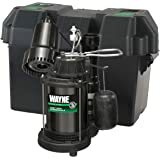 For more than 80 years, the Wayne brand has given homeowners security and confidence that their basements are dry, wells and sewage systems work reliably, and lawns, pools and outdoor areas are ready to enjoy. 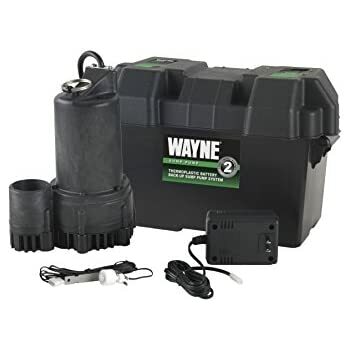 The WAYNE reinforced thermoplastic battery backup system includes a unique float switch design that will operate the pump with minimal travel area to fit in smaller pits, reducing float switch hang ups. 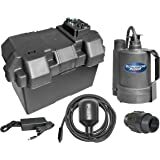 The professional grade back-up system keeps the battery properly charged and comes equipped with an audible alarm that alerts the homeowner when the back-up system is active. Designed for easy installation without any major plumbing changes. 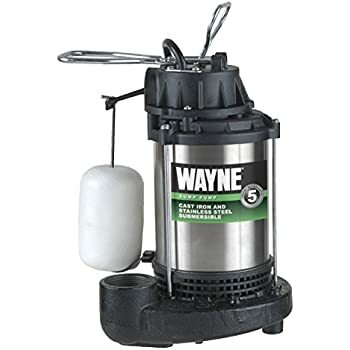 The most common water pump. Sump pumps are automatic pumps used to remove ground water from sump pits and transfer basement drainage to prevent residential flooding. 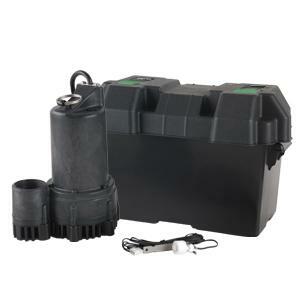 Battery Back-Up Sump Pumps are added in addition to your primary sump, and are powered off a 12 Volt battery. This completes your sump pump system and provides additional protection to remove ground water during a power outage, primary pump failure or heavy rain. 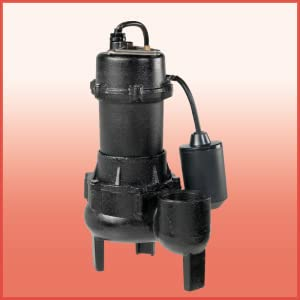 Sewage Pumps are automatic pumps used in heavy duty applications. Common applications include pumping waste from a bathroom to a sewer or septic line is a common application. 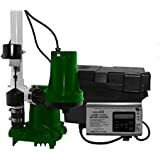 Utility pumps are multi-purpose pumps. Uses range from everyday applications around your home, to occasional use. Typical applications include removing standing water off basement floors or construction sites, draining aquariums and water beds. 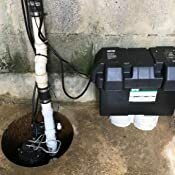 Well pumps are used to deliver water from an underground water source to your home, however, they are not submersible and are usually placed outside the well in a well housing. Well pumps can pump water from wells up to 25 feet deep. Well pumps can also be used as booster pumps. 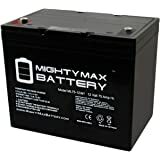 12-volt reinforced thermoplastic battery back-up system. Assembled in the US with foreign and domestic parts. Audible alarm and LED indicator lights informs the homeowner when the back-up system is running. 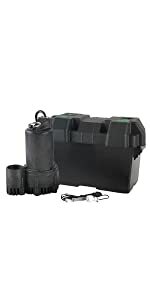 Back-up sump pump has corrosion resistant, sealed thermoplastic construction. 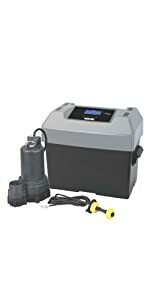 Back-up pumps max flow is 3300 GPH at 0 ft. Designed for easy installation. 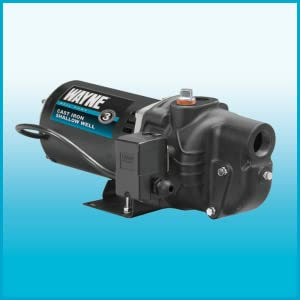 The Wayne reinforced thermoplastic battery backup system pumps up to 3300-gallons per hour. The Reed float switch design will operate the pump with minimal travel area to fit in smaller pits reducing float switch hang ups. The professional grade back-up system keeps the battery properly charged. Comes equipped with an alarm which alerts the homeowner when the back-up system is active. 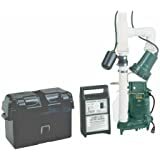 The ESP25 backup sump pump system is designed for easy installation without any major plumbing changes. 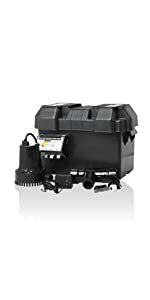 For this unit, I ordered a large Vmaxtanks 120ah AGM Marine battery with this and it fits perfectly into the plastic case that comes with the pump. The box measures 14" L x 9" H x 9" D. The wiring hookup is easy. There are 3 very different plug in connectors that you cannot connect improperly. The directions say to use 2 separate discharge pipes but it's ironic that the Wayne dual pump combination doesn't use two. No big deal though. 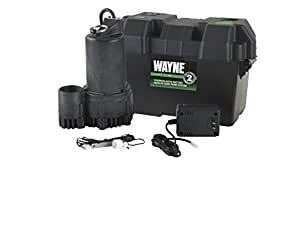 I connected the 12 volt backup pump to a new Wayne 3/4HP 120 volt primary pump with a "Y" PVC connector then to a single discharge pipe through a quick disconnect screw on type fitting. It's a 2" PVC pipe so there won't be any flow problem. I used PVC pipes for all of the connections except one. Since the 2 pumps were going to be a tight fit I'd have to be able to turn them slightly so I used a rubber (Fernco) fitting on the backup pump. I also did NOT put the check valves 3' up the discharge pipe as the directions suggested. If you put the check valves up that high you're allowing 3' of water to return back to the pit every time the pump stops and that causes valve thumping. 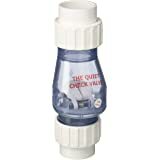 I used 2 check valves from Lowes that have threads right on the bottom of the valves. They screw right into the pump bases (I used some silicone grease to lubricate the threads so they won't seize up). The outlet side of the valve fits a 1 1/2 PVC coupling sleeve but that's where I used the Fernco rubber fitting. This way, for maintenance or if either pump quits, I can simply unscrew that fitting instead of cutting the PVC pipe. After everything was glued and set up I lowered the unit into the sump pit but the pumps wouldn't sit on the bottom. My sump pit is 25" deep by 18" across but, because of the Fernco fitting, I was able to turn the backup pump slightly and they both sat on the bottom nicely. The backup pump's float switch is not like the typical ones. This one only turns a timer on. The pump then runs for 20 seconds and this cannot be changed. It can be a problem if your pit isn't deep enough or if the float isn't mounted high enough. If either of those situations are true, the pump will empty the pit and keep running until the 20 seconds are up. WAYNE; THERE SHOULD HAVE BEEN SOME TYPE OF ADJUSTMENT ON THE CIRCUIT BOARD FOR THIS! I'm an electronics wiz so maybe I'll look into which resistor causes the 20 second run time and change it out to an adjustable one. (Any help with this Wayne)??? Second; I have a small electric FM radio on my desk and the circuit board in the battery cover blankets it out completely. I had to relocate the battery box onto the floor behind me to be able to hear my radio! WAYNE; USE SOME SHIELDING ON THE CURCUITRY & WIRING! Finally that irritating alarm! It does go off after @ 20 seconds but it needs a volume control! Being an electronics wiz, I solved the problem w/o doing any damage. I removed the 3 small screws that hold the circuit board onto the cover and found the little demon. There's a tiny hole in the gray plastic cover of the circuit board speaker. I GENTLY put a small piece of tissue into the hole and it quiets it down nicely. DO NOT put the tissue in more than 1/16 of an inch or you'll damage the tiny speaker. One more thing (not a gripe) is the charger itself. This is a heavy unit. It will not stay plugged into most electric outlets. I ended up using a small extension cord and laid in on the floor and it works fine. Now that all the demons have been dealt with, it's really a nice unit. To test the backup pump, I simply didn't plug in the 120 volt main pump and I guestimated where I should put the float switch then I let the pit fill up. The backup pump ran quietly for exactly 20 seconds but the pit was emptied in 18. Not a bad guess, eh? Then I plugged in the main pump and it worked flawlessly and very quietly! Hope this helps someone. 5.0 out of 5 starsYou will be happy with this purchase! 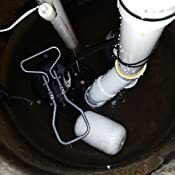 My sump pump, after 18 years of running, it was time for a new one. And since the battery backup didn't work, it was time for a new one. 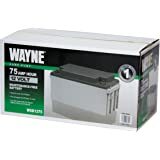 I researched online from plumbers' opinions and WAYNE was one of the most highly regarded brands. This was not a time to skimp on quality when the future of my basement is concerned! The pump comes with two check valves built-in, one for the main and the other for the backup pump. I dropped the pump in the sump, plugged it in, and poured water down the hole. Powered pump worked flawlessly and was QUIET. The water being pumped through the pipe was more noisy than the pump was. 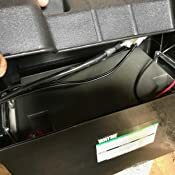 I bought two deep cycle marine batteries (29DC) I from WalMart, connected them in parallel, and hooked up a Battery Tender Deltran Battery Tender (021-0128) 1.25 Amp Battery Charger to it so it keeps them charged and never over-charges them. Now if the power goes out, I have about 10 days worth of sump drainage! Highly recommend this pump. Make sure you get a DEEP CYCLE MARINE battery. 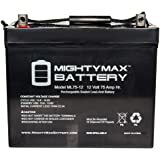 An automotive battery has a very high likelyhood it will burn itself out if it's power is completely drained just a few times. After contacting Wayne they acknowledged that the pump I received was defective. Wayne immediately sent me a replacement which works as it should. I am only giving them 4 stars due to the inconvenience of having to remove and install a 2nd a pump as a result of sending out a defective pump. Float defective! Very very annoyed! Purchased this pump to replace an aging Zoller with battery back up. So here's the deal, the actual float has this rod inserted through it, the first problem is that that you can simply pull the rod through the float, it is barely held on from the bottom, meaning it could simply pull off under the right circumstances. The second problem, the rod that holds the float which attaches to the lever/switch has an "L" bend in the end allowing it to go through the hole in the switch lever so it simply just loosely hangs on the switch lever. Well guess what happens when the pit fills with water to the point where it triggers the switch??? 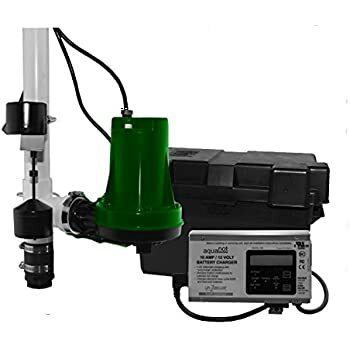 The rod simply slides out of the hole when the water level gets high enough to trigger the switch so the float and rod become detached and are floating around in the pit rendering the pump useless. Both design issues could render the pump inoperable then relying on the battery back up to be the primary pump. (see picture, sump pit filled with water, rod slid out from switch and float is laying flat floating around in a full sump pit - useless). And as another reviewer noted, the float and rod are very loosely attached so it does not just slide up and down, it wobbles all over the place, out to the side and can swing in just about any direction as the water rises possibly allowing for it to get hung up - again the potential to render it useless. I knew I should have stuck with Zoeller!